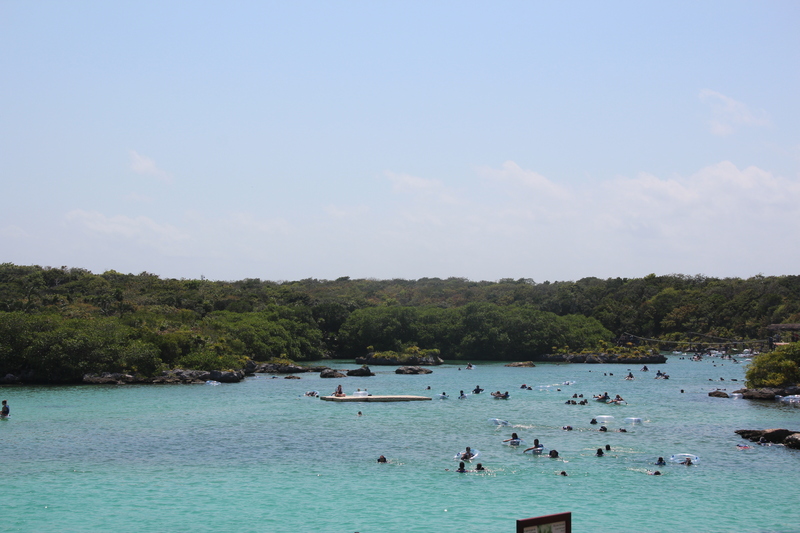 Xel-Ha is an aquatic park and has several water activities. So if you are a person very comfortable swimming & diving in water, Xel-Ha is a place for you. Kids will love this place that is loaded with so many water activities for them. Xel-Ha is also located outside the city of Cancun and is approximately 1.5 hours from the main hotel zones. Our tour bus picked us from the Hotel and we joined the rest of the group as we boarded the bus to the water park. Most of the tour packages when purchased in Cancun or online websites come with All Inclusive package. This includes the lunch buffet at around 5 stations, drinks, snorkel gear, life vests, lockers and towels. There are also other optional activities within the park that does not come with All Inclusive package. 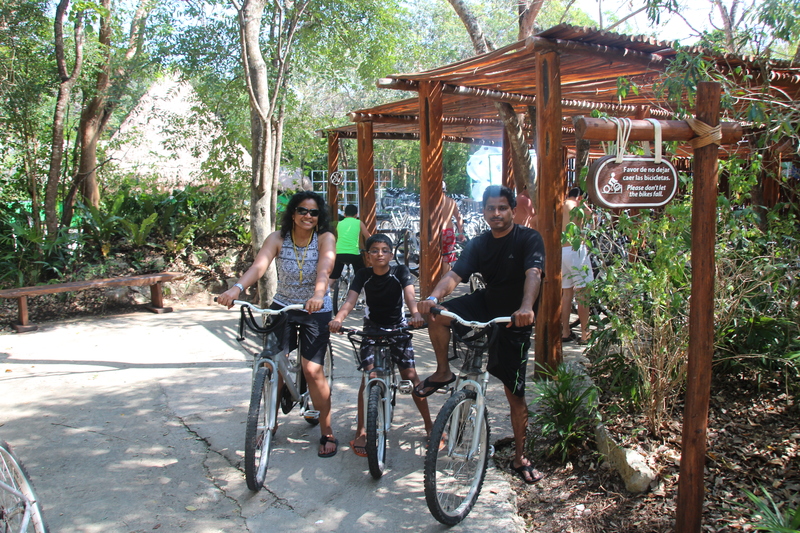 Ride & Swim with the dolphins, Scuba diving and zip bike are all paid activities within Xel-Ha Park. 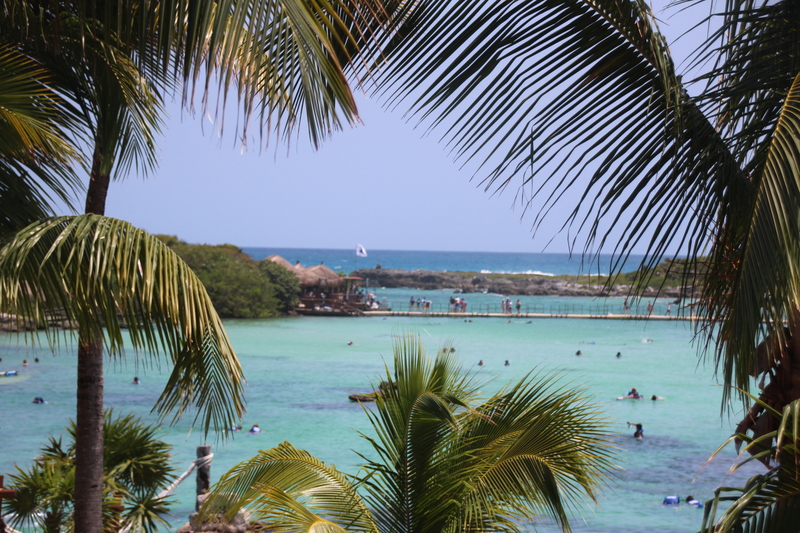 Xel-Ha is one of the world’s largest open aquarium surrounded by jungle. It’s really so beautiful to swim, snorkel and bike through the jungle. The famous ride is the tubing at the river point and the access to the river point is either by walking, biking or taking a shuttle. It takes close to 45 minutes of you are walking to the River point. We decided to do the biking and it’s always fun to do it as a family. It’s been awhile for me personally to ride the bike since my college days. As you are riding through the jungle, there are several animal species that roam around freely mainly the Iguana’s and raccoons. The Iguana reptile is plenty and you can see many of them crawling & camouflaging that I was scared initially seeing them cross under my legs. 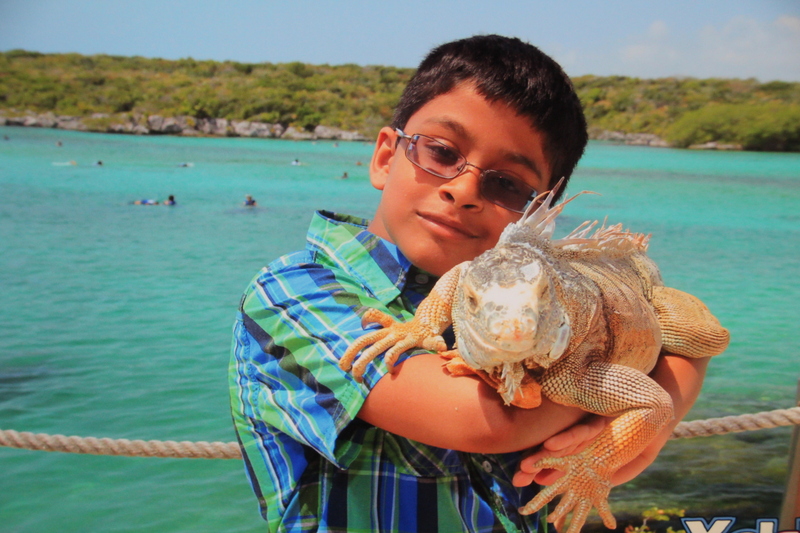 There are several photo session with the animals in Xel-Ha and most popular is with the Iguana and birds. Beautiful bird but could not locate the name of it. Tubing at the River point was really fun, thrilling & exciting for me. If you have read my previous, I have the fear of water and have still not gotten over it. I was very hesitant to take the tubing ride but Mani gave me the confidence and took the double seat so that I can ride with him together. Arvind was so excited that he didn’t really bother about us. He wanted to go alone and was very eager to leave the starting point. It’s a one hour drive and you can choose to go at your own pace. The river pathways were so beautiful and I started to enjoy the experience knowing that I’m safe with Mani. There were many stops on the way where you can snorkel or do mini zip line activity. There is a floating bridge inside the park which was another interesting attraction for many. We had some good time crossing the floating bridge and doing mini walks inside the jungle. As Arvind was planning swim with the Dolphin at XCaret park, we did not spend much time with the Dolphins at Xel-Ha. You can spend anywhere between 6 -7 hours at this park and as I mentioned earlier, this place would be great for people who love to spend time in the water & for anyone who wants to explore live interactions with Sting Rays or Dolphins in a more personable way. My son had a great time as he loves water – Mani & I enjoyed watching him have fun and we personally enjoyed the tubing & biking in the jungle.